Posting here in addition to sending an email to Ross Tech support with more info. I'm not new to vcds but am a new customer. I used my buddy's to check DTCs a couple of times over the years. I tried setting the coding with two different computers - win 7 and win 10 with almost exactly the same results. Downloaded the latest version 18.9.1 on each computer. Double checked my Login and Coding values against an auto scan from before the module failed. New module is the same PN as the old Bosch 5.7 module. One problem is the Login and Coding info doesn't seem to take and the Component description field wraps down to the Coding field. The letter "t" from "front" and "3428" start out in the Component field but after entering Login and Coding, they move to the Coding field. This happened with both computers I ran the software on. During one attempt I continued with steering sensor calibration but the DTC codes didn't clear: 00778 Steering Sensor and 01044 Module incorrectly coded. I get the same codes when scanning with my non-vcds scanner with ABS. The other problem is VCDS doesn't ask me to confirm locking 1 of my 3 VINs when setting the Coding. Makes me wonder if the software is acting up. Also, when I hover over the Login-11 box I don't get the full list of tips I've seen in examples. Instead I get only something about code 40168 - even when I haven't entered any Login / Coding info yet. I haven't figured out how to add images but I have screen shots before and after entering the Login and Coding. I see your screen-shots in the support inbox. I'll can post 'em in this thread for you if you want me to. I'm not sure what's up with that. 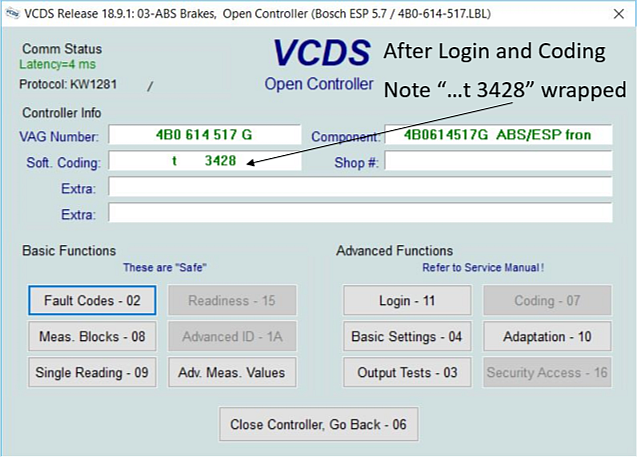 It could indeed be a bug in the current version of VCDS, or the interface firmware (and since you didn't include an Auto-Scan, I can't see what firmware is in your HEX-V2), or it could be your ABS module acting screwy. Let's do this: Go to [Options], set Debug Level to 1024, then click [Apply]. Now (without exiting VCDS), do whatever is necessary to reproduce them. When done, exit VCDS gracefully, then look in the Debug sub-folder and e-mail us the file named DEBUG-03.DLM. Oh, and please run a complete Auto-Scan and send (or post) that too. Yes please post the pics from the support email. It won't hurt. I emailed the debug file. One thing: after I entered debug mode and clicked on 3 - ABS brakes, a window popped up asking if I wanted to register the VIN. I clicked Yes and instantly got a Windows message: VCDS has stopped working. The only option was to close the program. That's the debug file I'm sending. I'll try it again before end of the day. Debug mode worked this time. It let me enter the Login and Coding, and the Coding stayed in the box. I wasn't sure about the process after entering code 40168 - left my notes in the house. I emailed the debug file. Something I just noticed - when not in debug mode the LEDs on the scanner quickly flash green and red. Not sure if it means anything. Also, it's still not working when not in debug mode. I can confirm we have debug files. I'm confident this will get looked at in the near future. Oh, and FWIW, your Login and Coding look correct to me. I have recently seen this also, guess there is an bug. But I was able to do the coding. 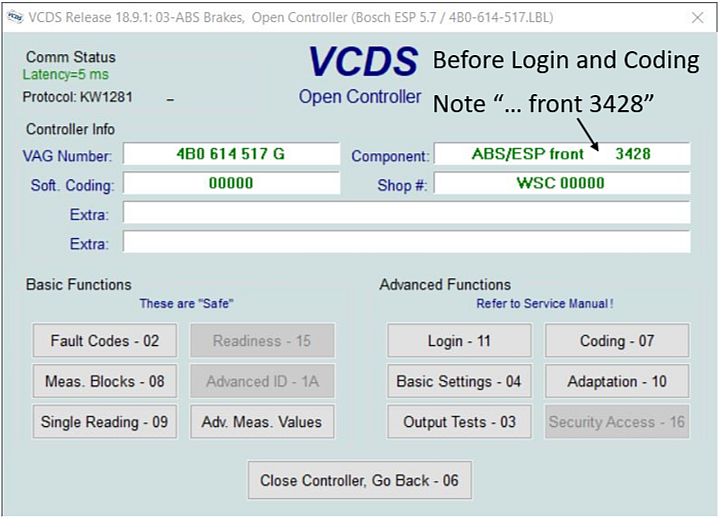 Have you tried to do the login > Coding > Basic setting in a row, quit VCDS and ignition OFF ? When I login & attempt to set the coding/wsc, I will get a message in the coding field reading "ad D56". The D56 part i recognize from the ABS module (also on both ABS module stickers) but I haven't found an explanation yet, made a little harder b/c both "ad" & "D56" are too short a term to be used in the search. ... the Bosch 5.3 owner's issue ALSO happened post-login/coding attempt, which might explain why more people haven't noticed, and it isn't popping up in Auto-Scans. I tried but with no success. The text wrapping didn't happen this time but the coding didn't stay. After turning the key back on the same codes 00778 Steering Sensor and 01044 Module incorrectly coded were still there. And you did this basic setting, right after Coding and before Ignition OFF ? Where did that ABS module come from?